Join a fun, healthy, walking Network! All4Fitness is offering a virtual wellness solution that can enhance your current fitness program. It is flexible and customizable! Now you can work out with friends and family all over the world…It’s simple, inexpensive and just as fun as any other social networking–but with a healthy twist! Welcome to the next generation of activity trackers. INSPIRE allows you to track daily activity – not just steps – in a small, sleek and ultra-modern device. 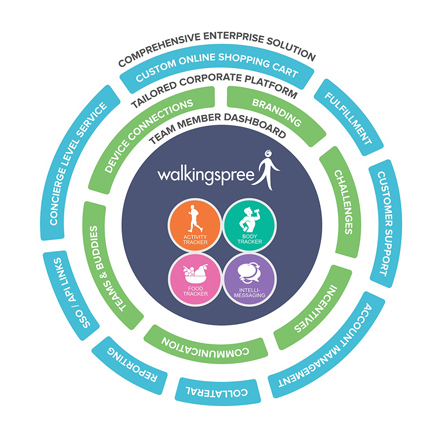 Walkingspree’s new tracker uses triaxial technology to better sense your movements. Users can wear the device clipped to their waist or on the wrist, both versions are included. Members also love the wireless syncing. Yes! Once the INSPIRE is registered, it automatically syncs every 10 minutes when next to the computer with the dongle plugged in. Users can view activity on the website throughout the day, compare steps with buddies in real-time, and see where they stand in challenges. Start tracking progress effortlessly using a high-quality, state-of-the-art device that aligns perfectly with anyone’s lifestyle or daily routine. No manual uploading or syncing necessary. The Inspire weighs in at just 0.317 oz (nine g), so you’ll find it light and convenient to wear. Clip Inspire on clothing or wear it as a wristband. Inspire is designed for Bluetooth 4.0, delivering advanced technology and reliability. Upload individual information wirelessly via iPhone 4S or newer iPhone or PC. The INSPIRE holds data for 30 days but a daily sync is recommended (in case of loss).